Human and veterinary cancer specialists at USask have been awarded $765,000 in federal funding to develop a new treatment for osteosarcoma, a type of bone cancer that particularly affects teenagers and individuals under the age of 25. It is also a common cause of death in large-breed dogs, such as Newfoundlands. “In teenagers and young adults, the survival rates have not improved for 25 years. One of our goals is to improve this,” said Ekaterina Dadachova, who holds the Fedoruk Centre for Nuclear Innovation Chair in Radiopharmacy, and is also leading the research along with pathologist Maruti Uppalapati. Osteosarcoma is the most common form of bone cancer. It has so far proved difficult to treat using conventional therapies and has a 70 per cent survival rate. If the cancer spreads to the lungs, there is an overall survival rate of less than 40 per cent. The cancer shows sweeping genetic variability from one tumor to the next, making conventional approaches to treatment difficult. In previous research, the USask team targeted a specific protein expressed by osteosarcoma cancer cells. The research team has developed radioactive antibodies which can lock onto this protein and target and destroy osteosarcoma tumors without harming healthy organs. The radioactive payload considerably slowed down tumor growth without side effects. Uppalapati, an assistant professor in the College of Medicine pathology and laboratory medicine department, will now create human antibodies designed to target osteosarcoma tumors in people. The radio-labeled antibodies—which direct the radiation to the tumor—would also be effective in dogs, which develop a type of osteosarcoma very similar to the human variety. The human antibodies are to be tested on human and canine tumors in a mouse model to assess dose safety and how well they work. Following this phase of the five-year research program, the USask team, which includes Valerie MacDonald-Dickinson and Dr. Ryan Dickinson of the Western College of Veterinary Medicine, hopes to make the treatment available to pet dogs with this type of bone cancer. The next stage would be a clinical trial for human patients with the disease. 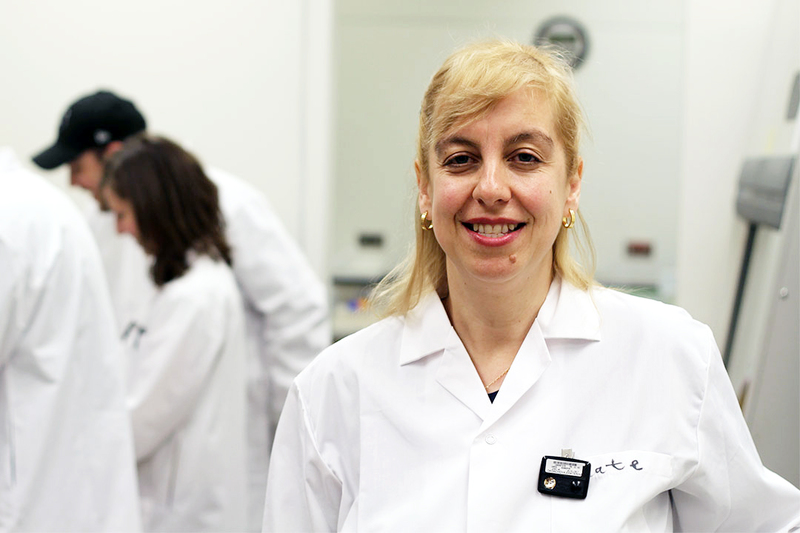 Dadachova, a professor in the College of Pharmacy and Nutrition, uses the state-of-the-art facilities at the university’s Saskatchewan Centre for Cyclotron Sciences, managed by the Fedoruk Centre at USask. The project is one of five USask health research projects awarded a total of $4.9 million by the Canadian Institutes of Health Research in its fall 2018 funding competition.